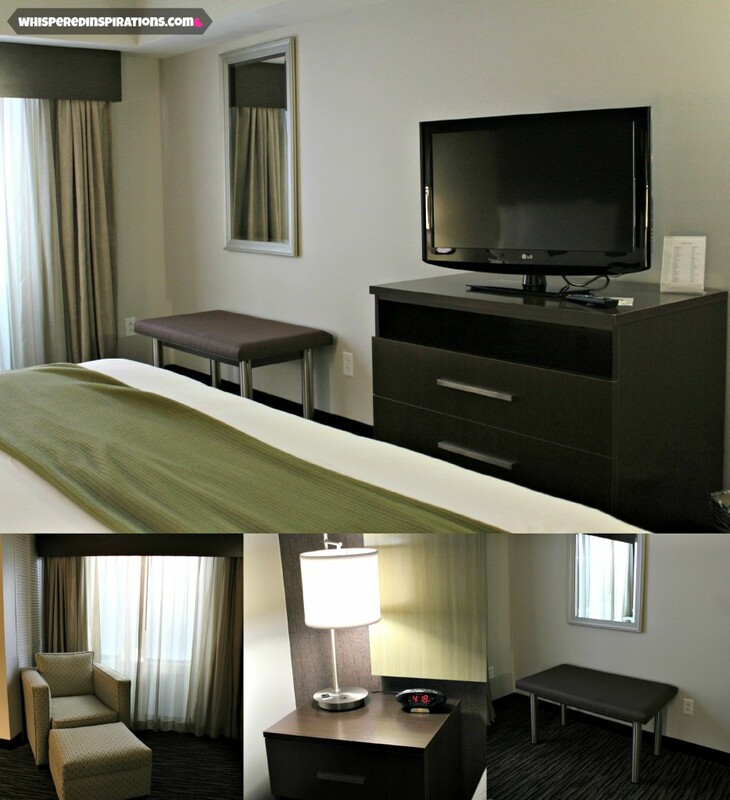 Holiday Inn Express & Suites. You saw all of the amenities that the Holiday Inn Express & Suites offers in my last post and now it’s time to check-in! The amazing people behind the Holiday Inn Express & Suites graciously provided us with a night’s stay at their North Fremont property. We were given a King Bed Suite with a guest living room that can sleep up to 5. We were travelling with our whole family, including grandparents which ended up being 6 but, one is a teeny one. The room was absolutely beautiful, spacious and clean! The hotel has 3 floors and we were given a room on the second floor. We were given two keys an they have tap technology where you don’t have to slide or stick the card in. You just simply tap the card and you are in! Another great thing about our room location was that the ice machine and vending machine was just around the corner and if we needed ice, which we did–it wasn’t far to get! 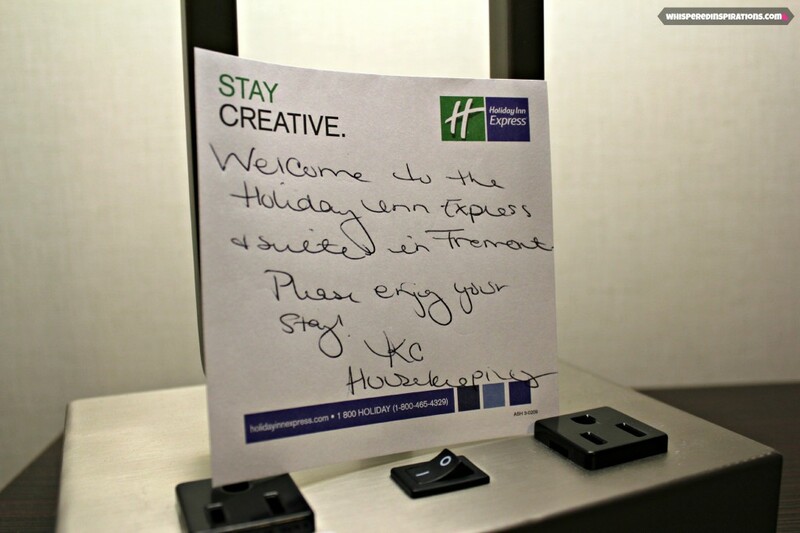 We walked into this nice little note from housekeeping and you could definitely tell that they have been there. The room was the perfect temperature and the crib and bed that we had requested were already in the room. One of the most important things to me when I choose a hotel to stay in is their star rating. I am an avid review reader and this location on North Fremont has a star rating of 4.6. Walking through the hallway to get up to our room on the second floor the hotel smells clean. I know that sounds odd but, nothing like a turn-off of a stinky hotel, right? 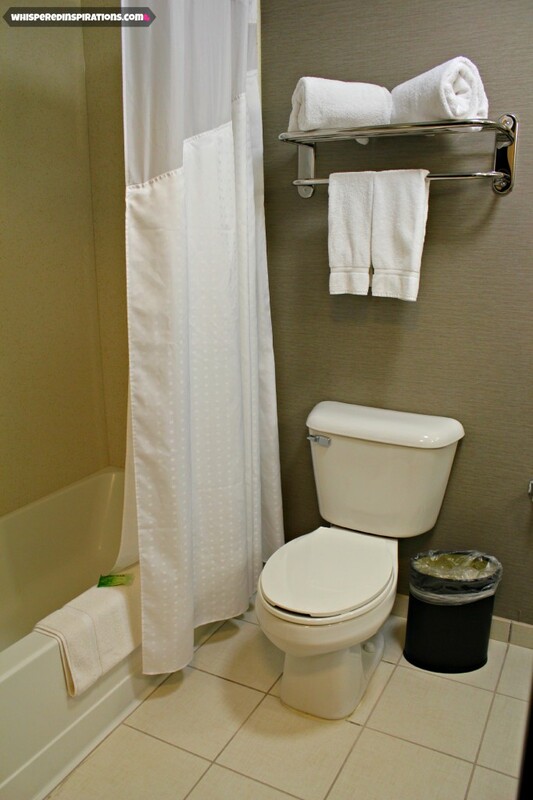 I don’t know about you but, whenever I stay in a hotel, I check out the bathroom first. After all, it’s the place you shower, get ready and use the most. 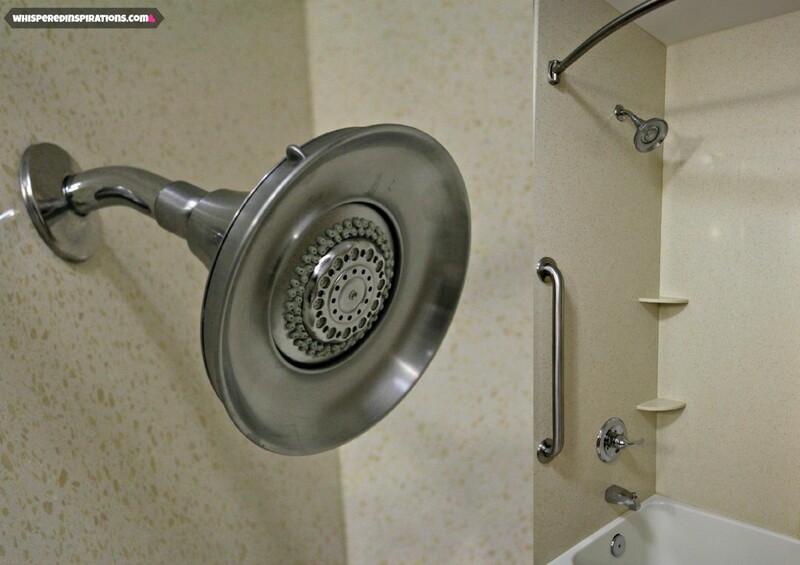 The bathroom is spacious and has plenty of towels, a hair dryer and an amazing shower. Another small but, oh so functional feature was the bath mat that hung over the tub, ready to be used. I don’t like getting the floors wet when I step out and putting that down helps avoid slippery floors! No worries, I was so anxious to take a shower that I didn’t want to dig into luggage to find my toiletries. The Holiday Inn Express & Suites had delicious smelling soap, lotion, shampoo and conditioner from Bath and Body Works. Not to mention make-up remover wipes to get you started into the world of clean. If you need any other type of toiletries, such as shaving cream, razors, tooth paste or toothbrushes, you can call the front desk. The shower was absolutely amazing, after having spent two days at a water park in Sandusky, I so needed a nice long, hot shower! I used their Bath and Body Works toiletries and the bottles are larger than most hotels. I have long hair and it was plenty, most times I have to use the whole bottle to myself. This time I didn’t have to ask for more and both the girls used what was left after me. The tub was clean and that my friends, I couldn’t ask for anything more! We had plenty of towels and after or family of four were so fresh and so clean, we needed more towels. We simply called down and the attendants brought us fresh, clean towels to restock and for my parents to use to shower. Did I mention we all took showers that night and not one person complained of not having enough hot water. The porcelain throne was pretty basic but, did it’s job well. The bed was nice and high and super soft. What my Hubby fell in love with was the pillows. You each get an option of Soft or Firm pillows. He loved them so much that he looked at who made them. Turns out they are from the Holiday Inn Express & Suites. I much loved the soft pillows and the sheets? Oh my God, you know when you do the laundry and wash your sheets? That intoxicating smell of clean sheets is what we smelled as soon as we pulled the sheets over us. Pure heaven. We had plenty of room for our family of four in our room. The girls went back and forth to see their grandparents and when it was time for lights out, we just closed the door. Hubby and I enjoyed this bed that we so very much miss and watched TV. The cable channels were stellar and they had much more selection in comparison to other hotels. We laid back, cuddled and watched our favorite shows after the kids had gone to sleep. The couch is actually a Queen size pull-out bed that my parents decided to take. My mom couldn’t wait to settle down for the night because the sheets were so yummy smelling. Hehe, maybe I get it from her. My parents slept soundly and felt perfectly rested and were the first ones to go downstairs for breakfast the next morning. They also watched their favorite shows before bed and praised the channels available and the blessing of the coffee maker! The living room/bedroom has it’s own TV and computer desk. Right next to the desk is a small kitchenette. What I loved the best is that we can watch our different programs and be in two completely separate rooms in one suite. You can make a cup of coffee and sit down with your laptop and use either the complimentary high speed internet or the wired one if you so deem fit. The WiFi was not spotty and really reliable which made me a very happy camper. I was able to check my email and do my work the same way I do at home and that is a major plus! We made use of the nice size fridge, full microwave, coffee and tea maker and plenty of disposable cups, plates and utensils too. We drove about 5 minutes down the road to a Wal-Mart Super Center and we decided to bring home some snacks, yogurt, fruit and frozen dinners. It was nice to just relax for the night and not have to eat out at a restaurant. Something quick and simple that we can enjoy while relaxing in our rooms watching TV. That is relaxation at it’s finest and everyone enjoyed it. After a very restful night’s sleep and the ability to really sleep-in–was glorious! Check out was at noon and they served their world-famous Holiday Inn warm breakfast until 9:30 A.M. Since check-out was late, I was able to hop onto my laptop and do some work before we left. 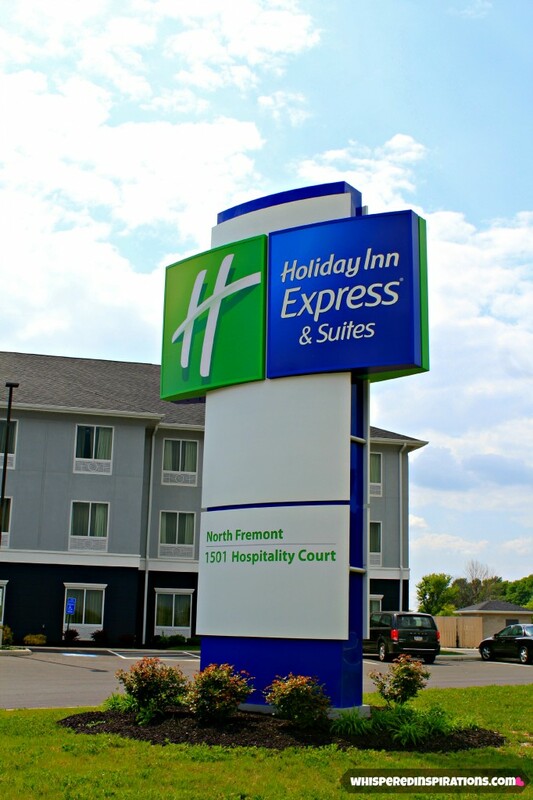 I would definitely recommend the Holiday Inn Express & Suites in North Fremont, Ohio. 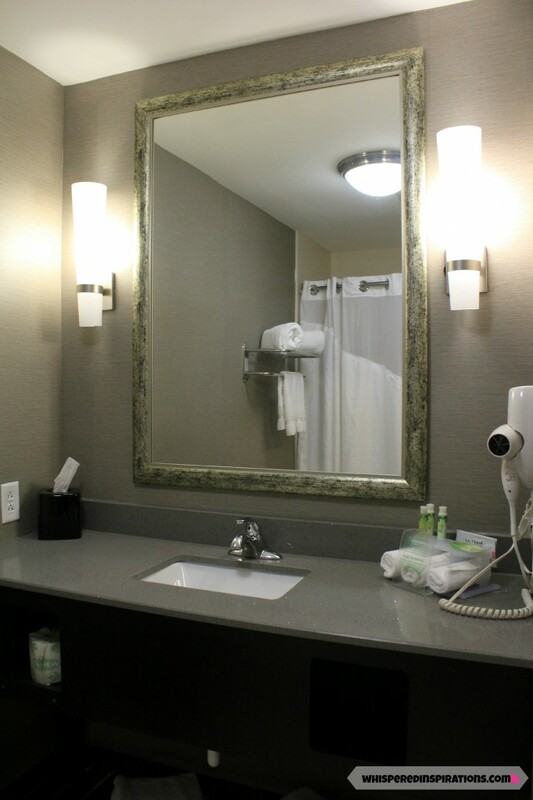 When I am in Ohio again, I’d love to stay here again because it is so well-kept and the service was great. You can really tell that the staff cares about the property. Anyway, I mentioned a world-famous breakfast, right? I’ll be posting about it very soon, stay tuned! What do you look for when you stay away from home? We sure are and it's always great to find a pristine and clean one, that's for sure! 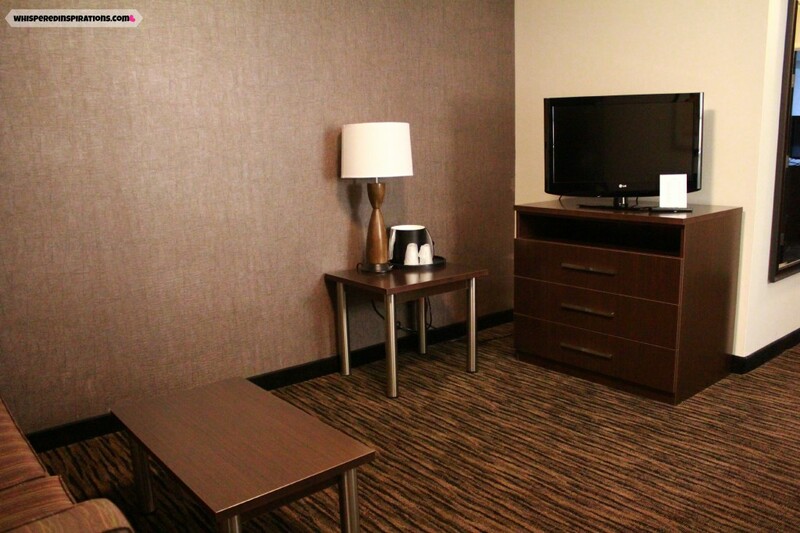 Your stay sounds nice and relaxed – just the way it should be! We look for a kitchen/kitchenette!! I have severe food allergies and I need to be able to make things I can eat. Many times we've stayed in hotels and I've been forced to "cook" out of a bar fridge, mini microwave & coffee maker. My recent post Hey, how do you spell vacuum? Love the kitchenette! Not too many hotels have one of those. It looks beautiful and it sounds like you were treated very well. Looks and sounds like a nice little place to stay. I've had pretty bad experiences with hotels, and I'm always worried about staying at new places without knowing what I'm in for beforehand. Thanks for posting this! Thanks Holly, I always look ahead of time to decide where to stay. The beauty of this hotel is the location and it was super clean! Great review. 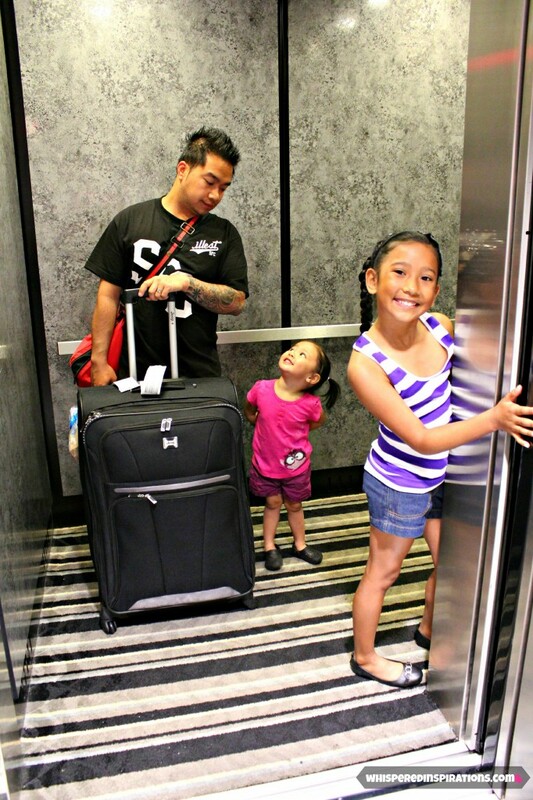 We have stay at the Holiday Inn express before and loved it, it was a great place to stay. Me too, they smell so good! We love staying in suites now that we have kids. Great review to read. Will have to look into a holiday inn suites next time. You had me at "plenty of towels"! That along with bathmat and Bath and Body Works are definite pluses! Looks like a very classy hotel. Family trips are awesome. This hotel does look nice and clean – very important. It is always nice when it is newer and in great shape. We haven't been disappointed at the two HIExpresses we have stayed at either. Very well taken care of, you can tell the staff cares to keep it that way. 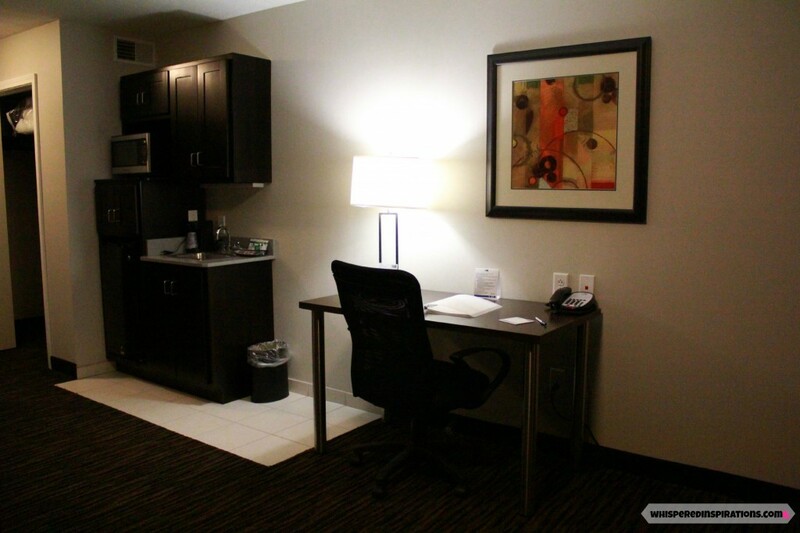 I have also stayed in the Holiday Inn Express Suites and share your opinion. It has always been clean and very fast and efficient. I love when I can have breakfast included in my stay – more often in the US though…. I would recommend to anyone to stay. The breakfast was soooo good. 🙂 I mean people were fighting over the cinnamon buns! LOL, I don't blame them! Wow! That has to be the nicest/cleanest hotel I’ve seen! I live in Cleveland but do constant trips thru Toledo. Definetely gonna make a pit stop in Fremont to spend a night with my wife! Great pictures Nancy! Nice place! I also check out the bathroom first, too! So nice! I am really getting a good impression of Holiday Inn and Suites! Can't wait to hear about the breakfast! wow, stunning hotel room! 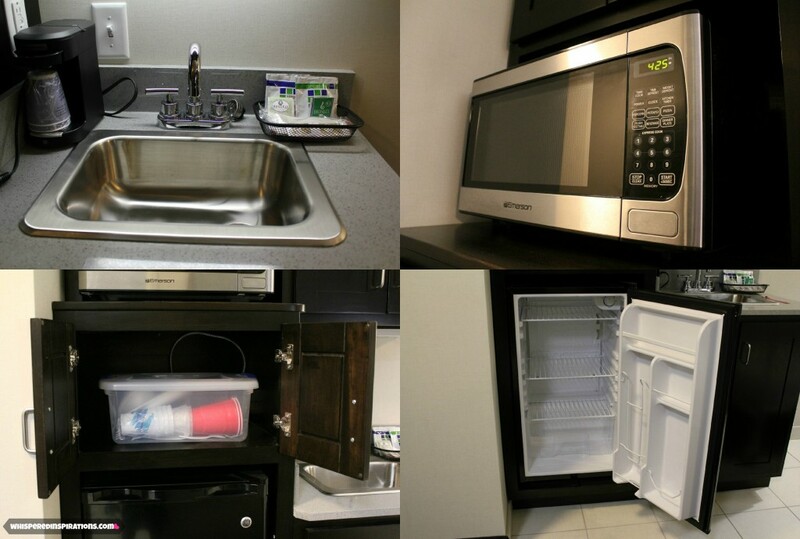 we love staying in suites because we prefer to cook our own meals instead of eating out. this is the cleanest hotel i've ever seen. Wow this is certainly a change from one I stayed in years ago and swore to never stay at another one but this is beautiful and you have changed my mind. I love how spacious and to have products that come from bath and body works is even more awesome most hotels have some brand of their own and they leave you sticky and yucky! Thank you for the review and for making me want to go now! That looks like a very comfortable hotel. 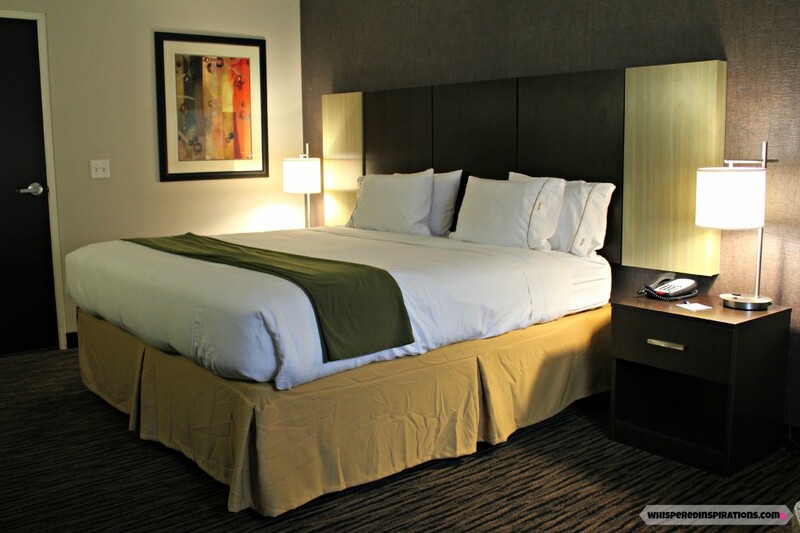 I like the chain hotels when I am traveling and don't feel like doing research or if I have extra money and time I will look for a boutique hotel. 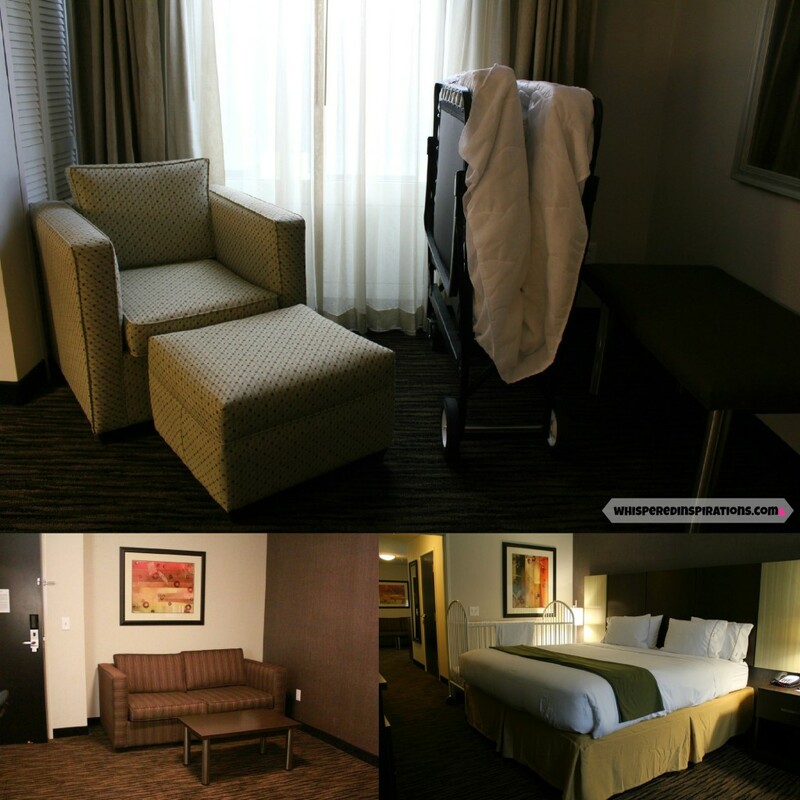 Its so hard to find a great hotel and a great room with an adequate kitchenette – all suites are not created equal!! Love the note they left you! The room looks really nice. 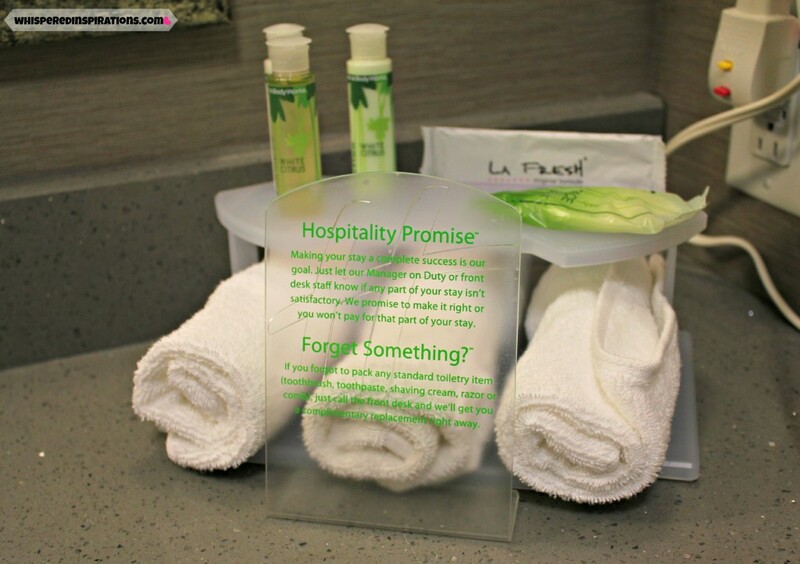 I think I will have to rethink Holiday Inn – great post! The Holiday Inn is classing up!! I stayed at one in Oakville (Bronte), Ontario when there was a wedding close by, even though we both lived in Oakville. We went back about a month later for a couple nights. Very nice! I'm with you. Cleanliness is the MOST important thing when you're staying in a room thousands of other people have stayed in before you. Especially in the bathroom. I love the HIE. We stay at one wherever we go. With a large family, the breakfast is fantastic and you collect HIE rewards, we now have three free nights.